Author Stephen King will develop his novella "The Colorado Kid" into an hour long TV series titled "Haven" for Canada's E1 Entertainment. Former "Dead Zone" honcho Scott Shepherd will executive produce "Haven" with Lloyd Segan and Shawn Piller. Former "Dead Zone" writers Sam Ernst and Jim Dunn will script the pilot. E1's John Morayniss and Noreen Halpern will also executive produce, committed to producing 13 episodes. E1 previously set up the Canadian/US series "Copper" for ABC/Canwest and "The Bridge" for CBS/CTV. 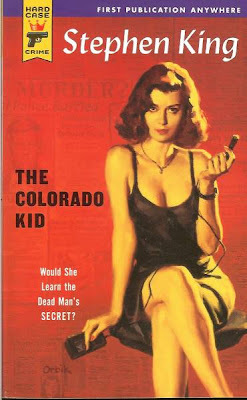 "The Colorado Kid" mystery novel was first published in a 2005 paperback-only edition, written by King for the 'Hard Case Crime' imprint. The third-person narrative concerns the investigation of the body of an unidentified man found on a tiny island off the coast of Maine. Lacking any identification or obvious clues, the case reaches nothing but repeated dead-ends. Well over a year later the man is identified, but all further important questions remain unanswered. The two-man staff of the island newspaper maintain a longstanding fascination with the case, and twenty-five years later use the mysterious tale to ply the friendship and test the investigative mettle of a postgrad intern rookie reporter.